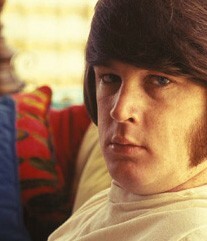 Forever Young: Brian Wilson in the 'Pet Sounds' days. In the post-Elvis, pre-Beatles doldrums of the early 1960s, the early Beach Boys singles were a brine-tinged breath of fresh air on the Top 40 airwaves. With Brian Wilson co-writing the songs and orchestrating the tight, multi-part, sometimes contrapuntal (and disarmingly nasal) harmonies of his brothers and their band mates, the Beach Boys exported a romanticized Southern California of surf, cars, girls--and yes, even school--to the world. When the Fab Four asserted their unprecedented chart dominance in early 1964 (limiting the otherwise irrepressible "Fun, Fun, Fun" to a number five peak on the charts), the Boys of Hawthorne responded with a determination to match the Beatles' energy and innovation. And for a time, they did. "I Get Around," an infectious slice of suburban restlessness, was inarguably more complex than "Love Me Do" or "P.S. I Love You," which preceded it up the charts by a few weeks. And the teen angst of the hot-rod ballad, "Don't Worry Baby," on the flip side was certainly more emotionally sophisticated than the sunny pop of "A Hard Day's Night" a month later. But Lennon and McCartney were just hitting their compositional stride, and the trans-Atlantic rivalry spiraled upward into 1966, when Rubber Soul was challenged by Pet Sounds, which even now is widely seen as the high point among Beach Boys' records. Revolver later that year upped the ante yet again, but Brian Wilson answered with quite possibly the greatest pop single ever released, the incomparable "Good Vibrations." He then embarked on his most ambitious project, an album to be called Smile. But just as it was nearing completion, the Beatles raised the bar yet again. While Sgt. Pepper's Lonely Hearts Club Band defined the Summer of Love for many, its brilliance sent Brian into a vortex of despair. He scrapped Smile, destroying many of the tapes (the album later titled Smiley Smile was an attempt to patch together what survived), and fell into a creative tailspin for the next two decades. The band soldiered on (Brian had retired from touring before Pet Sounds), and continued to score such occasional hits as "Darlin'" and "Do It Again," but never again reached the artistic or commercial peaks of their earlier work. Surf's Up (1971) was a tantalizing taste of a return to form, but subsequent albums of new material went from inconsistent to weak to pathetic. The emergence of the "oldies" radio format boosted demand for their live shows, however, and the group, in some form, has never really gone away. Brian, however, was far gone--lost in a fog of mental illness and sequestered for years by a would-be Svengali psychologist who even asserted co-author credits on a few of the substandard songs Brian somehow ground out during that time. Finally, in the late '80s, he began to emerge from his extended funk, issuing a generally uninspired, self-titled solo album in 1988. Through the next decade, he began to perform occasionally and another solo album, Imagination, was released in 1998. Alas, it was even less distinguished than the first. Undeterred by Imagination's flop, Brian assembled a band capable of recreating any of his records on stage and began to tour more enthusiastically. Pet Sounds Live is just what its title suggests, drawn from a series of London concerts in 2001, and he topped that this past summer with a return to London in which he resurrected Smile in concert. After all this tortured history, I would like to report that Brian's new disc, Gettin' In Over My Head (Rhino), is a triumphant comeback. But I can't. Sure, it's the best of the three--faint praise indeed--and it does have some agreeable moments: the opening duet with Elton John, "How Could We Still Be Dancin'," evokes both men's stellar past; "Desert Drive" echoes the classic Beach Boys driving songs; and Eric Clapton injects some badly needed rock verve into "City Blues." Brian's skills as an arranger are fully displayed throughout, and may be the best thing about the record overall. But in the absence of a worthy lyricist, too many of the songs are trite fluff, including the saccharine pairing ("A Friend Like You") with Paul McCartney. Still, there's just enough here to keep the faint hope alive that somehow, someday, Brian Wilson might just deliver one last masterwork. But this, unfortunately, isn't it.